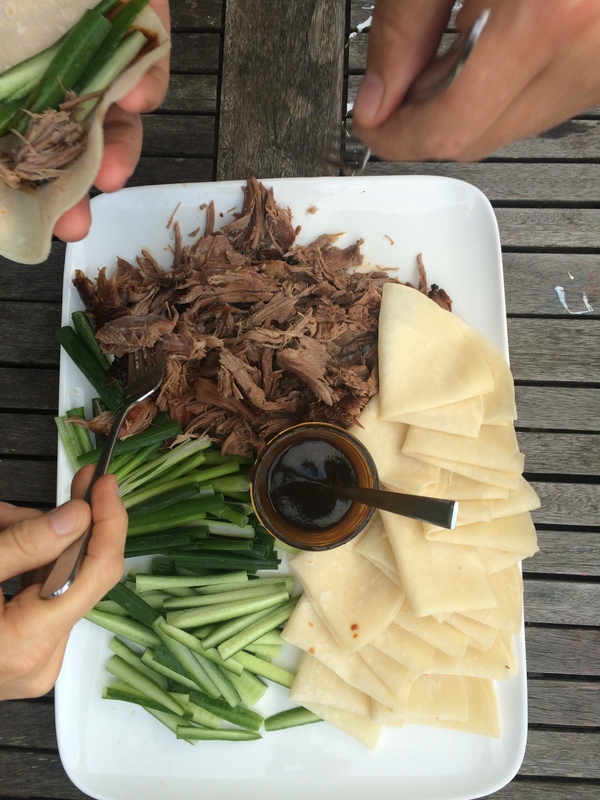 I love this dish, and sometimes I make it with duck, But this time I had to feed a crowd, Its great for entertaining , as all the hard work is done at the table. Let your guests serve themselves and add what they like. The sauce is very important here, its very versatile and goes with lots of meats, such as chicken and pork and even great on prawns. I also used this sauce on my vegetable rice paper rolls, and crumbed chicken breasts.I use Chinese Black vinegar , as its has a certain depth to it, use regular white vinegar if you cant get your hands on some black vinegar available at Chinese grocer stores. 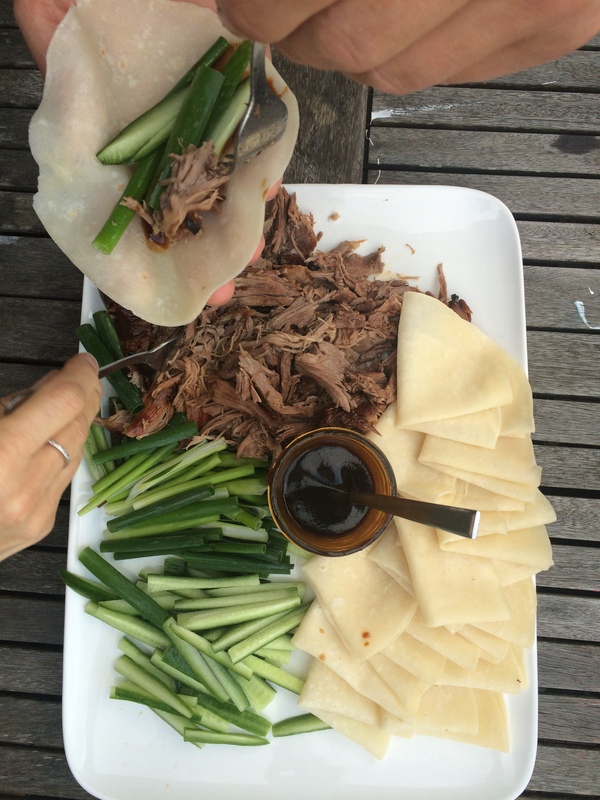 The Peking Duck pancakes are also from the Chinese grocer, and usually I buy a few packets , they vary in packet sizes as they are usually made by the owner. I go to my Local Chinese Grocer, and ask for them, as they are “out the back ” in a freezer. You can make them but they are time consuming and easier to buy. I freeze them so they are also on hand for a quick meal. I use this base of pancakes, shallot, cucumber and cut up chicken schnitzel for an easy weeknight meal. 1 Preheat oven to 160c Or 140c fan forced . In a small bowl combine olive oil, garlic and cinnamon powder and star anise. Place lamb leg into a deep oven dish. 2 Spoon cinnamon paste over lamb to cover. Add star anise to roasting dish. 3 Pour 2 cups water down the side of the baking dish, cover with foil and roast for 1 ½ -2 hours. Remove foil, and top up with water if necessary. Roast for another 1- 1½ hours, till golden and meat is falling away from the bone. 4 With two forks shred the meat in the baking dish off the bone into the lamb juices. 5 Combine hoisin with vinegar and sesame oil. Place pancakes on a heatproof plate in a steamer basket over boiling water for 1-2 minutes till softened.Place lamb on a platter with cucumber, shallots and folded pancakes. 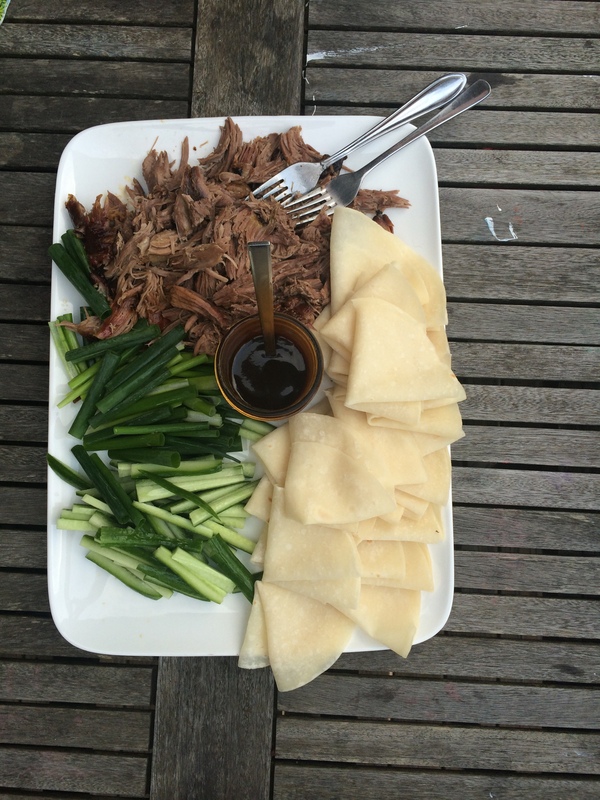 Serve with hoisin sauce and let your guests serve them selves . WE love prawns in our house and these ones are always great when entertaining . Try and buy the large ones, as you wont have to clip and trim too many if they are big. Trust me I bought the small ones once and I was trimming and clipping the legs for hours ! Start with some really fresh prawns . You will need a sharp pair of scissors to trim the legs and a small sharp knife to chop the head off . With a small sharp knife split the prawns down the middle leaving the shell intact, and not cutting all the way through. Flatten out with the back of a knife . Set aside while you make the sweet chilli sauce. Add equal parts caster sugar with white vinegar and about 5 cleaned coriander roots. Place in a small saucepan, with 1 chilli , chopped and add a splash of water. cook over medium heat for about 5-7 minutes till slightly thickened and starting to become syrupy. Allow to cool completely and strain. Should taste sweet with a hint of vinegar, add fish sauce and squeeze in the juice of 1 lime to serve. 1 Remove heads from prawns with a small knife. Trim legs with kitchen scissors. With a small sharp knife split in half lengthways not quite all the way through. Lay prawn on a flat surface shell side up. Using the palm of your hand, or the flat blade of a large knife , press prawn flat. 2 Preheat BBQ flat plate to high and cook, flesh side down for 2 minutes, turn and cook for 1 minute. Remove onto a platter and drizzle with sauce. 3 To make sauce- cook sugar and vinegar in a small saucepan for 5-7 minutes till syrupy, add chillies and cook for 3 minutes more. Remove from heat and add fish sauce and lime juice. Drizzle over prawns. Serve with extra limes and coriander .